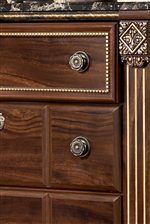 The replicated mahogany grain, gorgeous paneling and gilded details of this traditional king poster headboard are echoed in the coordinating footboard. Gold line carvings and black marbled details add refined texture to the four sturdy posts, while bead and rope details adorn the headboard and foot of the bed with their golden splendor. 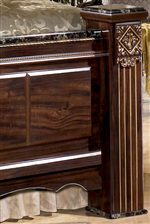 The rich Dark Brown finish and mahogany grain are highlighted on the smooth panes of the footboard, which features a curved apron for added visual interest. 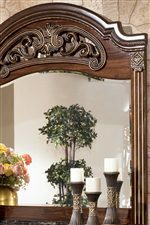 Pair with coordinating end table, chest and mirrored dresser for a dramatic twist on traditional decor. This bed is available in queen and king sizes. The Gabriela Traditional King Poster Bed with Faux Marble Detail by Signature Design by Ashley at Crowley Furniture & Mattress in the Kansas City Area: Liberty and Lee's Summit, MO & Overland Park, KS area. Product availability may vary. Contact us for the most current availability on this product. B347-66 King Poster Footboard 1 81" 8" 35"
B347-68 King Poster Headboard 1 82" 5" 70"
B347-99 King Poster Rails 1 84" 78.75" 18"
Case Detail Fluted bun style feet for support. Richly finished bead, carvings and rope details throughout the collection. Drawer / Shelf Construction Framed top drawers with gilded bead detail. Side roller glides for smooth operating drawers. Description: Top Select pieces feature a faux marbled surface for refined texture and depth. 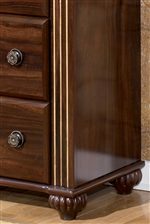 The Gabriela collection is a great option if you are looking for Traditional furniture in the Kansas City Area: Liberty and Lee's Summit, MO & Overland Park, KS area. Browse other items in the Gabriela collection from Crowley Furniture & Mattress in the Kansas City Area: Liberty and Lee's Summit, MO & Overland Park, KS area.